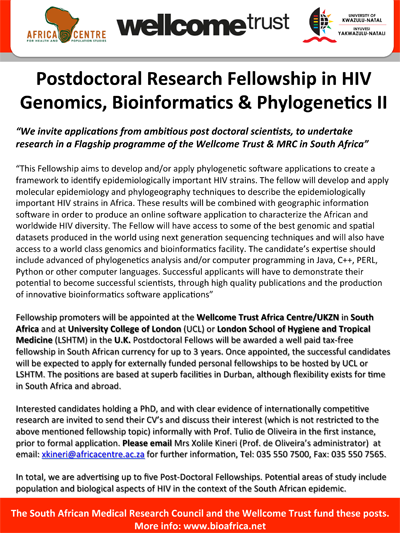 We invite applications from ambitious post doctoral scientists, to undertake research in a Flagship programme of the Wellcome Trust & MRC in South Africa.This Fellowship aims to develop and/or apply phylogenetic software applications to create a framework to identify epidemiologically important HIV strains. The fellow will develop and apply molecular epidemiology and phylogeography techniques to describe the epidemiologically important HIV strains in Africa. These results will be combined with geographic information software in order to produce an online software application to characterize the African and worldwide HIV diversity. The Fellow will have access to some of the best genomic and spatial datasets produced in the world using next generation sequencing techniques and will also have access to a world class genomics and bioinformatics facility.